This delicious healthy Courgette (Zucchini) lasagne is a delicious vegetarian twist on the traditional Italian recipe. 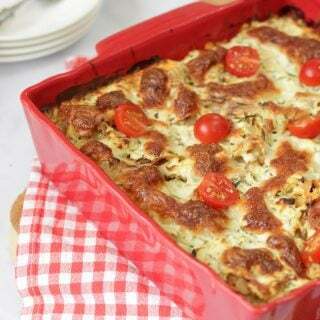 It is made with courgettes, mushrooms and ricotta cheese so is perfect for “Meat Free Mondays”. It can easily be made gluten free and is also great to cook ahead and freeze. How do you make Courgette Lasagne? This Courgette Lasagne (Zucchini Lasagne) really is super simple to make, from kitchen to table in 45 minutes. Firstly preheat your oven and then finely chop the onions and garlic. (As always I have used my cheats version by buying frozen ready chopped versions). Fry them until the onion has softened and become translucent. Next remove half of your onion mixture and set to one side. Add the chopped mushrooms (both chestnut and button for additional flavour). Stir and cook for a further five minutes. Now add a tin of chopped tomatoes and bring to the boil, seasoning well with salt and pepper. Mix your grated courgette with the onion mixture you set aside and stir in the ricotta cheese. Whisk an egg and add to the courgettes and cheese, season with salt and pepper to taste. Now you are ready to start assembling your Courgette Lasagne. How many layers should a Courgette Lasagne have? Good question, if a lasagne doesn’t contain at least three layers it simply just won’t do! I don’t think there is a perfect number of layers, but it is important to use a nice deep dish so you can pack as many as possible in. The first step to layering this Courgette Lasagne is to spread a thin later of the mushroom mixture on the base of your dish. Top this with about a third of your lasagne sheets, just one layer, so the mixture is well covered. Next add a thin layer of the courgette and ricotta mix. Then layer in your pasta sheets. Simply repeat the mushrooms, pasta, and ricotta layers until you have used all of both of your mixtures. When you have finished layering sprinkle mozzerella generously on the top. 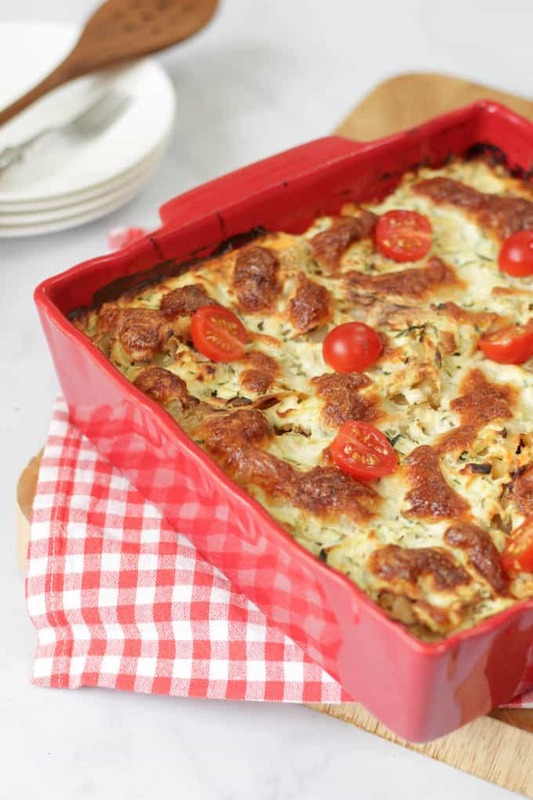 Bake your Courgette Lasagne for around thirty minutes, until the top is golden and bubbling. Serve with a green salad, cherry tomatoes and if you aren’t feeling virtuous some crusty bread. How far in advance can I make a Courgette Lasagne? This is the perfect make ahead mid week supper. It can be assembled, covered and kept in the fridge for upto 3 days before cooking. If you prefer you can also cook, chill and then freeze for around a month. You should defrost the lasagne thoroughly in the the fridge before reheating. When reheating food make sure it is absolutely piping hot throughout before serving. It really does make a huge difference to the texture of your Courgette Lasagne to chop the onions and mushrooms quite finely. When I’m not using ready chopped vegetables I would recommend the Domu mini food chopper. It really is a fab little piece of kit. It’s really important to use a good deep dish for your Courgette Lasagne, a lasagne just isn’t a lasagne without plenty of layers. Be sure to use the coarse side of your grated (or food processor) for grate your courgettes. I used a fine one here and the texture wasn’t quite as good. For the green fingered amongst you Courgettes are so easy to grow in the garden. If you fancy some other vegetarian recipes have a look at my Broccoli and Stilton Soup and Easy Courgette Fritters. I’d love to know how you got on and what you thought of the recipe if you make this Courgette Lasagne. Please rate the recipe and leave me a comment below if you do. This super healthy and delicious vegetarian meal, is perfect for family suppers and is the perfect lasagne alternative. Pre heat oven to 180C (fan) 160c (conventional). Lightly spray an ovenproof dish with cooking spray. Heat the oil in a large pan and cook the onion and garlic, stirring until softened. Remove half of the onion mixture and set aside. Add the mushrooms and cook for 5 minutes before adding the tomatoes. Bring to the boil and season with salt and pepper. Meanwhile, squeeze the excess water from the grated courgette and mix with the reserved onion mixture and the ricotta. Add the egg and season with salt and pepper. Spoon some of the mushroom mixture over the base of the dish. Top with a third of the lasagne sheets. Spread with some of the ricotta mixture and repeat until you've used everything. Sprinkle with the mozzarella and bake for 30 minutes or until golden brown and cooked through. Serve with salad and cherry tomatoes. 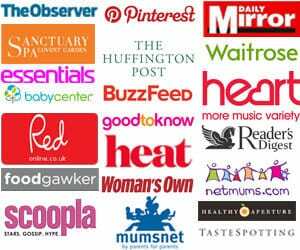 This blog post may contain affiliate links. This means that I may get a small commission from any purchase that you make, however it will not affect the price you pay. Wow! 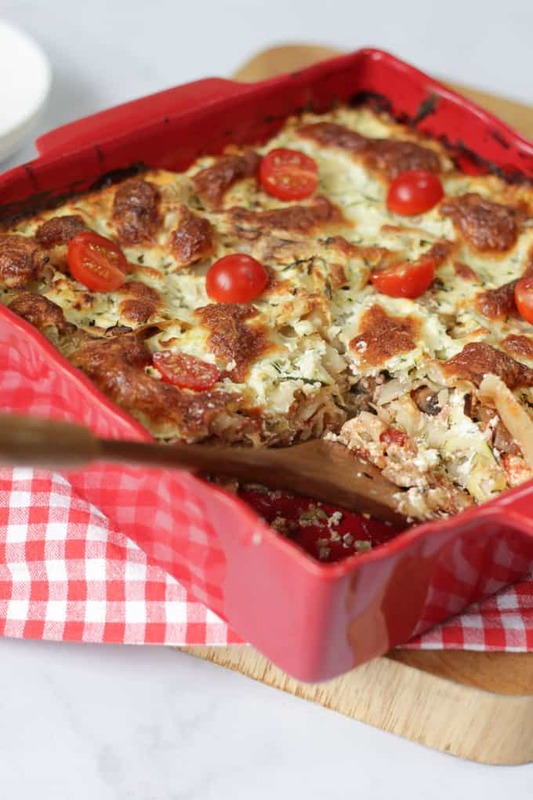 This looks really delicious and would love to try this Mushroom Courgette Lasagne. In fact, I will try this tonight since I have all the ingredients available. Thank you for this wonderful idea on what to cook next. This is great, perfect for a lasagna lover!